Pay it forward. Be kind. A little help can brighten someone’s day. Long-distance trails like the Pacific Crest Trail and Appalachian Trail and the tradition of trail magic on them teach these virtues well. Anyone who has hiked a large portion of them will tell you that. When hikers receive trail magic (future section and thru-hikers—you will! ), the desire to give back and pay it forward becomes an enduring lesson from the trail. It often becomes one of the deep seeds planted to carry back into life off trail, too. This holiday season, I want to invite you to pay it forward, be kind and help Jack and Neoma Wisdom, two longtime trail angels of the PCT. 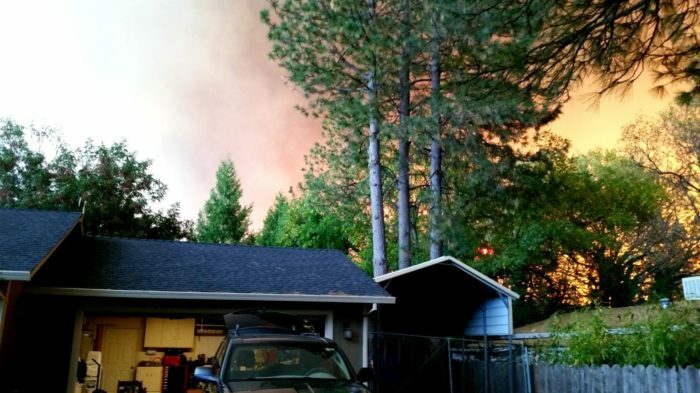 The Wisdoms are rebuilding their lives after losing everything in the Camp Fire in Paradise in California last month. 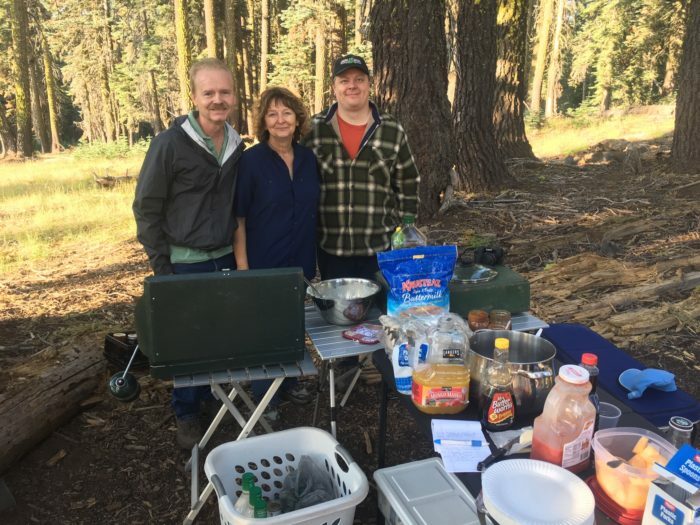 Jack and Neoma Wisdom, pictured with son Rueben, are longtime trail angels on the Pacific Crest Trail (PCT) who lost their home in the Camp Fire that destroyed the town of Paradise, CA. A GoFundMe page is set up to help them and their families recover. If you’ve paid attention to the news recently, you probably read about the Camp Fire in Northern California, the most destructive in California history, that ripped through the towns of Paradise and Concow. 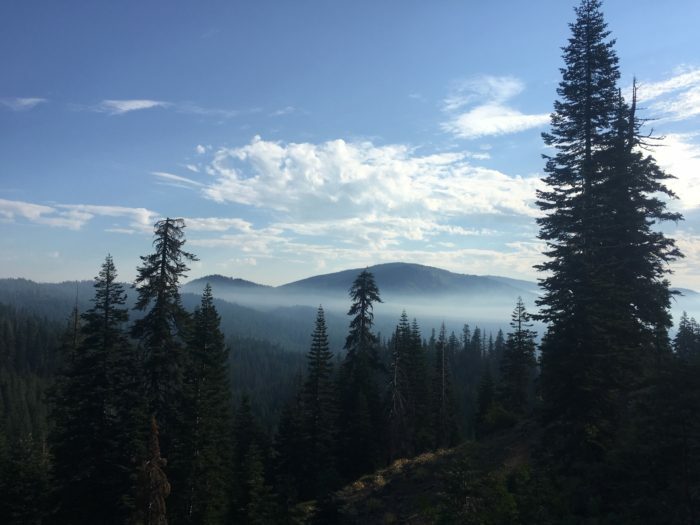 Paradise is near the midpoint of the PCT—north of trail town Belden and south of trail towns Quincy and Chester. The Camp Fire started on the morning of Nov. 8 and within hours wiped out 95% of the town of Paradise. 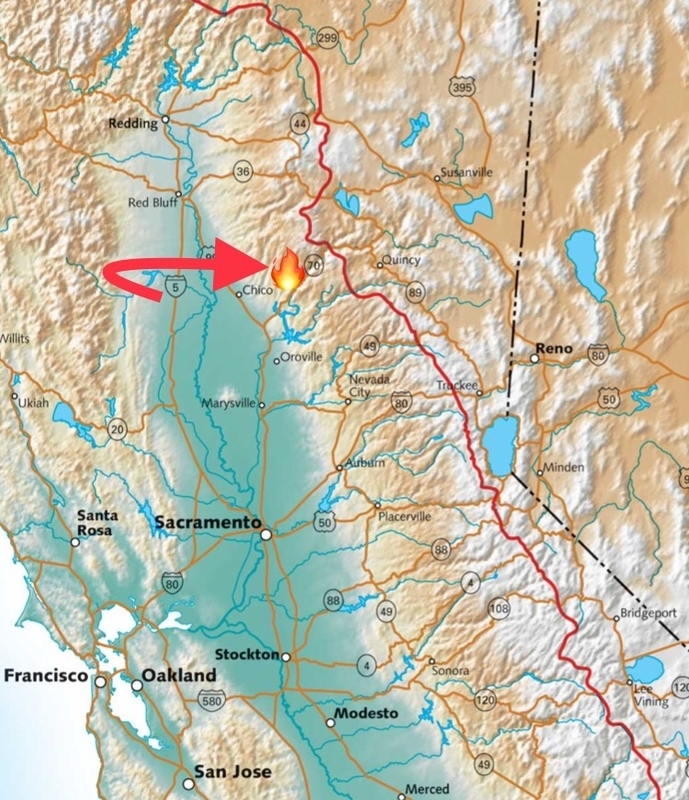 A 60 Minutes interview with Cal Fire Chief Ken Pimlott reported, “The fire was growing at a rate of one football field a second (one acre per second).” 19,000 buildings, businesses, and homes burned to the ground. Along with tens of thousands of residents in Paradise, the Wisdoms lost their home and everything in and around it. Neoma has four sons and three of them lost a large portion of what they owned — Rueben lost his car and all belongings except two suitcases worth of his life; Cullen, a raft guide, lost his 16-person whitewater raft and household/personal goods stored at his parents’; and son Dean, his wife and two grandsons lost everything in their apartment in Paradise. So did nearly all of their neighbors and friends. On the PCT—noted by the red line in this picture—the town of Paradise is located off trail but very near to the trail. Paradise is due west (or north in terms of trail miles) of Quincy and Chester. When I finished my thru-hike of the PCT in 2017, I sent the Wisdoms a thank-you note, along with dozens of other trail angels, family, and friends who helped me along my journey. I never expected to reconnect with them in the wake of a disaster. The Wisdoms no longer live in Paradise and their home is no longer there. They lost their house and everything inside and around it. So did two of their kids who lived in Paradise and many of their friends and neighbors. But they lived. Currently, the Wisdoms are staying with Neoma’s mother in nearby Chico. They plan to relocate to another nearby town. Because the devastation in Paradise was so severe, so too went many of the jobs and the buildings where people once worked in and around town. The Wisdoms’ home in Paradise, pictured, was burned to the ground in the Camp Fire. 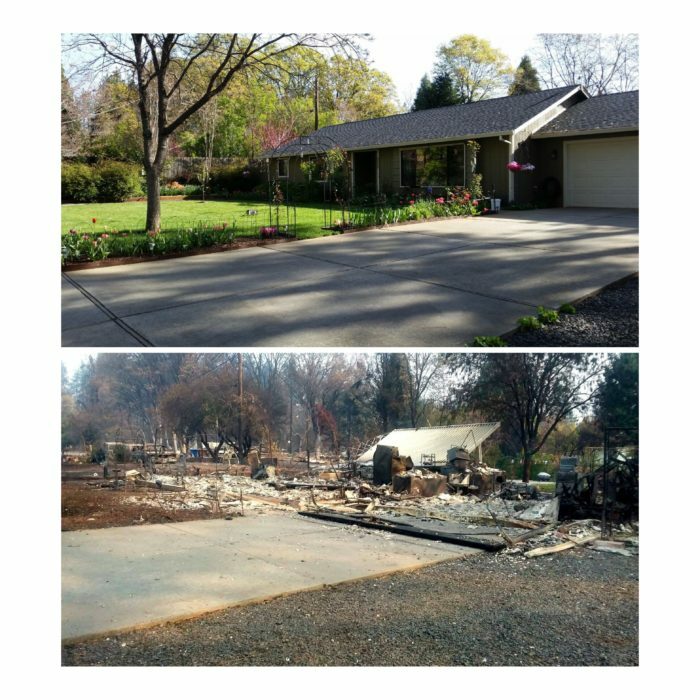 The top photo shows it before the fire, and the bottom shows what was left after the fire. Originally from California, Neoma grew up backpacking with her mom and took her first child on the trail at just six months old. Jack is from Tennessee. They met and married later in life and one of their shared passions is spending time outdoors and giving back. On their days off, Neoma said, “Jack knows where I want to be and what I want to do—be on trail.” They often spend much of that time on the PCT. And for over ten years, the Wisdoms also find spots along the trail to host trail magic cookouts for hikers. Neoma (standing) and Jack (center, facing camera) feeding thru-hikers at trail magic in July 2017 on the PCT on Humboldt Summit and Humboldt Road, near the trail’s midpoint. They had camp chairs for hikers, a table with homemade food, and homegrown produce for dinner and breakfast. 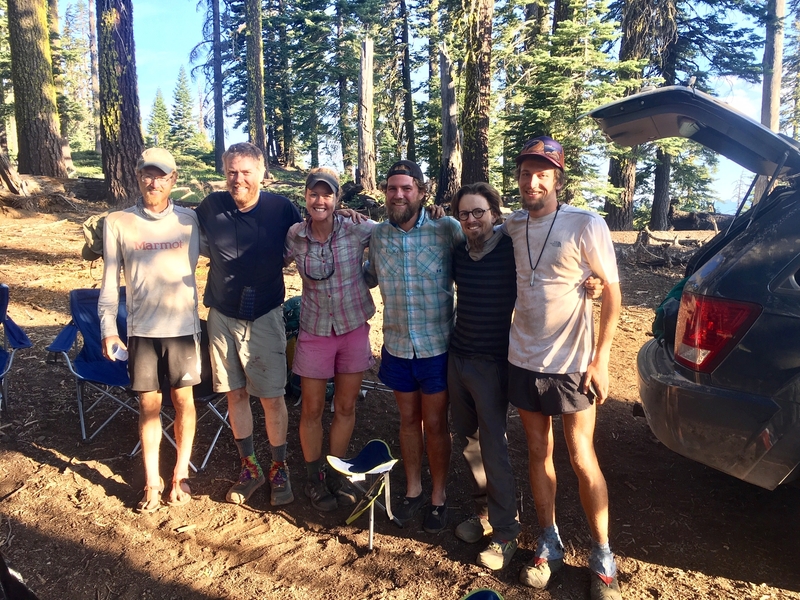 I met Neoma, Jack, and Rueben (one of Neoma’s sons) on the PCT in 2017 when they hosted trail magic as I thru-hiked. Around 5 p.m. I was ready to stop and set up camp for the night, but I met a southbounder (SOBO) who encouraged me to keep walking a few more miles to “…some really good trail magic ahead!” So I did until reaching Humboldt Road and Humboldt Summit. I arrived in the final daylight hours to a magnificent view from Humboldt Summit. Neoma waved me over to a circle of camp chairs and said, “We have lots of food, honey!” She motioned to a table full of fresh, homemade food (aka, every thru-hiker’s dream), including “haystacks,” or Neoma’s version of a vertical make-your-own taco salad, beans, chips, homegrown cucumbers, homegrown tomatoes, homemade pomegranate lemonade with fruit from Neoma’s mom’s farm, and homemade cake. The view from Humboldt Summit and Humboldt Road, where I met the Wisdoms. They were providing trail magic with a gorgeous view between Tehama and Plumas counties as a backdrop. That evening the Wisdoms told me and the other thru-hikers stories of meeting one another; Neoma leading Boy Scout trips for her sons in the nearby woods; feeding and bonding with PCT hikers over the years. After dinner, Neoma and Jack camped in their Jeep Cherokee, and Rueben camped in a tent alongside me and two other thru-hikers. The Wisdoms’ kindness characterizes the spirit of trail magic. At its core, it is generosity and friendship with total strangers that brightens the day and leaves a lasting imprint on one’s hike. Before saying “bye” after breakfast, I took their photo and address, a ritual I developed on the AT to remember and later thank trail angels. Trail angels Jack and Neoma Wisdom, with son Rueben, serving trail magic for PCT hikers at Humboldt Summit in Northern California (mile 1,309.8 in 2017). This is the photo I took before saying “thank you” and “goodbye” after the trail magic. Katie “Captain Planet” Rapp (AT 2015 , PCT 2017) deserves great credit for reminding me and many fellow hikers about the Wisdoms. After the fire, she posted a note on a PCT Class of 2017 Facebook page asking if anyone had contact information for the “trail angels from Paradise.” I did because of the ritual of trail angel photos and addresses for the post-trail postcard. 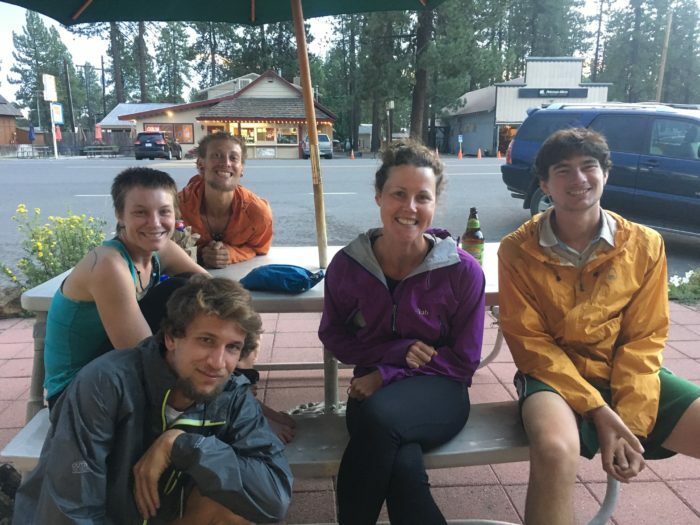 Katie “Captain Planet” Rapp, pictured (blue tank top) posted a note on the PCT Class of 2017 Facebook page to remind thru-hikers about the Wisdoms. Captain Planet and I received trail magic from the Wisdoms within hours of each other and later met in Chester, CA, along with fellow NOBOs Fresh Prince, Flask, and Baby Squirrel. This month I reconnected with the Wisdoms via phone and they shared their harrowing story of the fire and their evacuation from Paradise. The morning the fire started, Neoma evacuated before most residents. 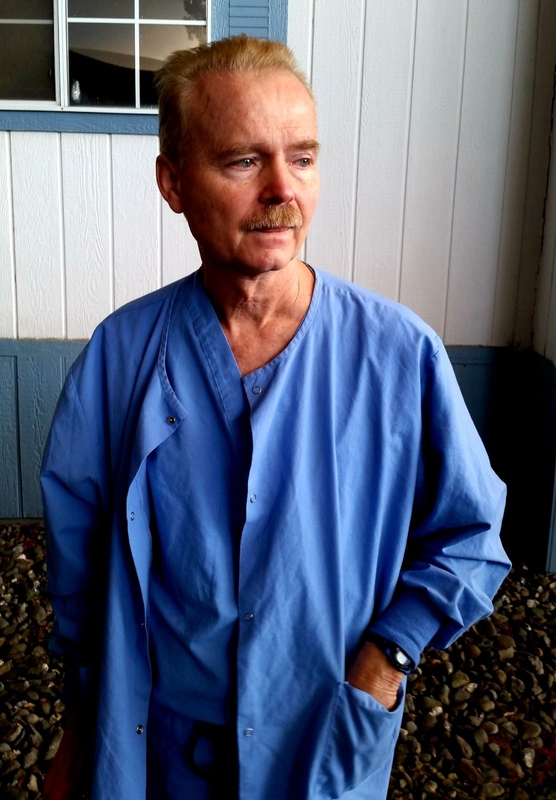 Jack, a registered nurse first assistant in surgery at nearby Adventist Health Feather River Hospitals, woke for his morning shift and noticed a fire “…not too far behind their house.” He called the hospital to ask about the fire but no one knew of it or any imminent danger yet. Neoma evacuated her home, pictured, before most people in Paradise. Before his early-morning shift at the Adventist Health Feather River Hospital, Jack noticed a fire behind the house and encouraged her to leave even before the official evacuation. Even before an official evacuation order, Jack told Neoma to leave town. He told me that the “…frequency of forest fires and evacuations each summer gave me a sense that this one was different. And dangerous.” Neoma got in her car drove to her mother’s in Chico. Meanwhile, Jack went to the hospital to start his shift. Not long after starting surgery, Jack and his team in the operating room were told the fire was in the hospital parking lot. Time to evacuate. After helping patients and staff at the hospital to evacuate, Jack got in his car and drove down Pearson Road, one of the few roads out of town, where fire engulfed everything in sight—trees, homes, even cars. At one point Jack saw a man walking down the street with his dog and said, “You need to get in the car!” Moments earlier the dog woke the owner to alert him that the house was on fire leaving them mere moments to escape. 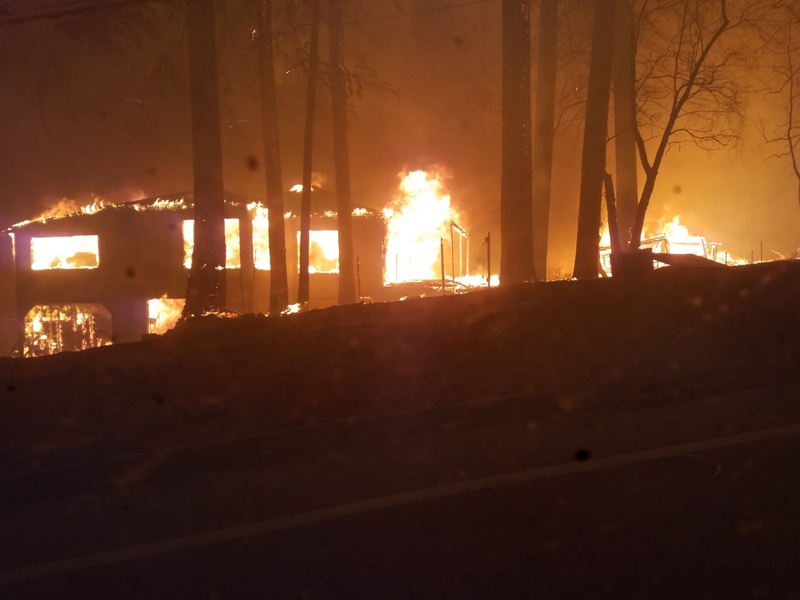 Leaving the hospital where he worked, Jack drove one of the roads out of town, pictured, where nearly everything around was burning—homes, trees, cars and buildings. But he kept driving and was able to get behind a Cal Fire (California Fire) bulldozer and crew. Jack says following the Cal Fire truck and bulldozer, “Probably saved my life.” He later returned to the hospital where a temporary triage area was erected to treat people and help others who cut not evacuate. Four long hours after Jack last talked to Neoma, who had no idea if he was alive because “calls kept dropping,” they were reunited. 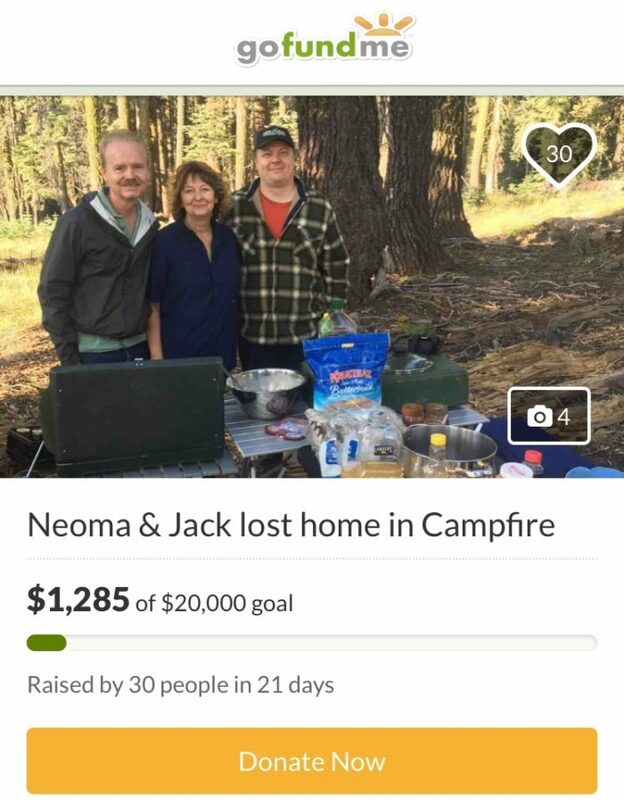 When I talked with Neoma, I also asked her permission to share their GoFundMe page with fellow hikers. And then Neoma went on to say something unimaginable to me at her juncture. 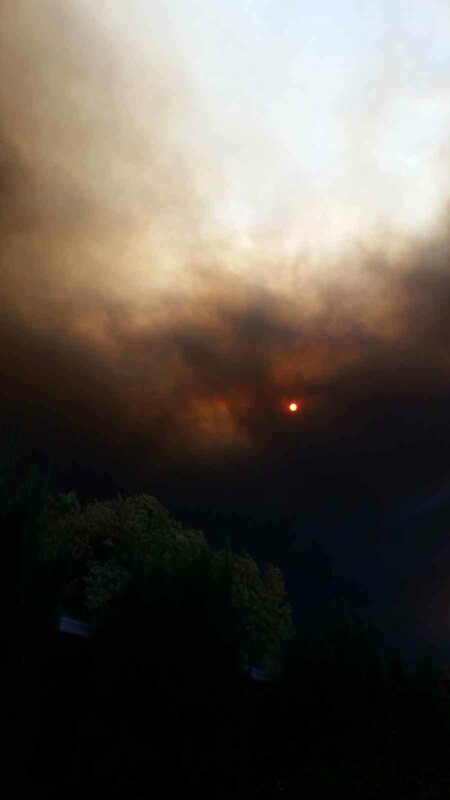 During the Camp Fire, smoke was so dense that it blocked out the sun entirely for a long period of time. On trail, there are endless forms of trail magic—anonymous coolers of soda in the woods, water caches in dry spots, rides from a trailhead, food, and more. Each is equally special. Receiving trail magic also leaves a desire in hikers to return the favor after their hike. And like most forms of giving, doing so often provides as much pleasure for the giver as the receiver. In addition to magic on trail, sometimes there are opportunities in the hiking community to pay it forward off trail. This is one of those. When starting and/or finishing a long hike, one must begin anew, again. The transition is abrupt but must be faced. While the reason for a hiker’s new path and the Wisdoms’ is very different, they share one commonality—the support of people around you helps. I met the Wisdoms in 2017 during my PCT thru-hike. They fed me dinner and breakfast over 12 hours along with many other thru-hikers, including (left to right), Milkman, hiker trail name unknown, Jack Attack, Cat Weasel, and Fresh Prince. Please consider donating via the Wisdoms’ GoFundMe relief page. Below are some hiker-inspired amount ideas. Any little bit helps! Alternatively, if would like to support/donate or write to the Wisdoms, you can send an email request here for their contact info. Also, here are additional opportunities to support relief for those affected by the Camp Fire. Thank you so much for posting this; it’s so important that we remember to give back to the community that’s supported us. I’ve also wondered about the owners of the Dardanelle Resort, who opened their doors this year and were kind to many a NOBO going through (as per guthooks comments). When I went through SOBO in September, I was shocked and saddened to hear that the resort had burned to the ground in the Donnell fire (which also briefly closed the trail near Sonora Pass) just months after the kind new owners had bought it. I had wanted to check back to see if there was any way to donate, but had completely forgotten. Your post is a great reminder to me and to all of us! Thanks for letting us know, Laura. I finished the AT this year and plan the PCT for 2020. Glad to be able to send a little bit of love and support to Trail Angels who give so much to thru-hikers.